This video covers events at Standing Rock, ND on Tuesday Sept 27, 2016. The Dakota Access Pipeline, now under construction, is being blocked by the largest gathering of Native American tribes in US history. The pipeline plans to carry 450,000 barrels of crude oil a day, and would cross the Missouri River multiple times. Native Americans and others downstream fear that the pipeline will eventually leak and then contaminate what is now pure water. 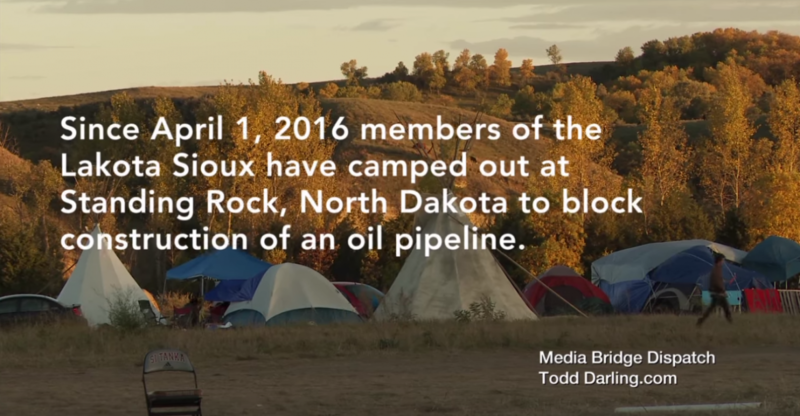 The camp to block the pipeline started April 1, 2016 and has now grown to a population of 2-3,000 people. On Sept. 9 Pres. Obama requested and then received a “voluntary” halt to pipeline construction within a 20 mile radius of where this massive oil pipeline would first cross the Missouri River. But, news early this week that work had resumed within the boundaries of the “no construction zone” motivated the actions taken by several hundred people from the camps on Sept. 27, 2016. Please note, some portions of the video are of very low resolution. ©2019 Cardinal · Built with love by Fabian Productions.